In this level, the objective is to enable the pupil to feel confident writing academic-level compositions. All the rules and spellings taught in Books A and B are revised at regular intervals to ensure that nothing is forgotten. 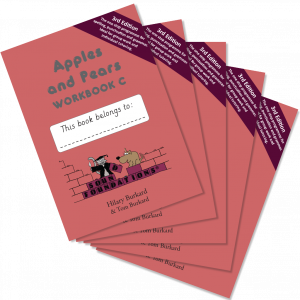 This page of dictation exercises shows the level of proficiency expected at the end of Apples and Pears Book C.
Look inside Apples & Pears Teacher's Notes C.
In this level, pupils learn why we change the ‘y’ to ‘i’ in ‘studies’, but not in ‘studying’. All the rules and spellings taught in Books A and B are revised at regular intervals to ensure that nothing is forgotten. The emphasis changes to words of Greek and Latin origin; these are highly predictable in morphology, but they cannot be spelled as they sound. The word ex-cept-ion-al-ly consists of 5 building-blocks, all of which can be used in many other words. This reduces the amount that must be memorised to an absolute minimum. 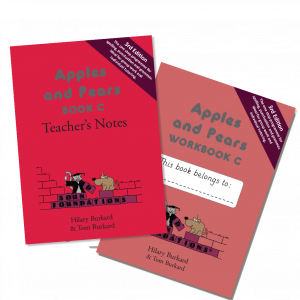 It also works in harmony with the ‘wordbuilding’ exercises in Dancing Bears Books B and C by increasing pupils’ awareness of the structure of English words. Just as importantly, the meaning of these words is taught both by definition and in context. 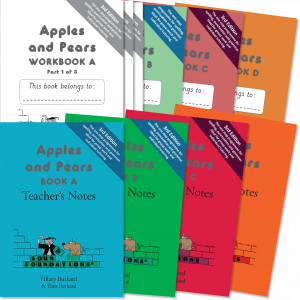 The objective is to enable the pupil to feel confident writing academic-level compositions.